James was born in 1881 at Kingston Buci. He was a fruiterer and nurseryman at his orchards in Middle Road and sold his produce to, amongst others, the nearby Cooks jam factory. During the 1890’s and the early 1900’s he played for Shoreham F.C. eventually becoming the club’s trainer at a time when they were the most successful side in the county. In 1907 James married Edith Audrey Gates (apparently not one of the Shoreham Gates) and the couple subsequently had two sons and two daughters. One of his sons, James Henry born in 1916, served as a Captain with 212 Battery, 111 Field Regiment in WW2 but was killed during the North Africa campaign. An enthusiastic and successful athlete he was also the Sussex half-mile champion in 1913 but it was his involvement in local amateur dramatics during the 1920’s and 30’s for which he is best remembered. 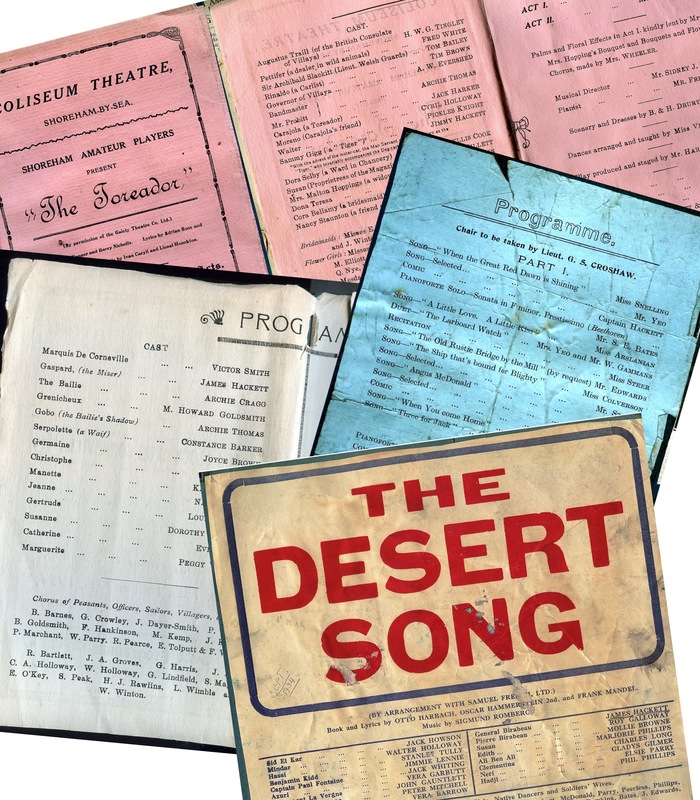 A newspaper report of 1957 records that following a performance by the Shoreham Amateur Players at the Coliseum theatre the company presented a silver salver to James and Edith (she had worked for many years behind the scenes) to commemorate their 50th wedding anniversary and paid tribute to his acting performances over the years. James died in 1958 at Brighton aged 76. Frederick Wood was born at Kingston in 1865 the son of a corn merchant and master baker Frederick’s parents lived next to the Adams family of bakers in the High Street. 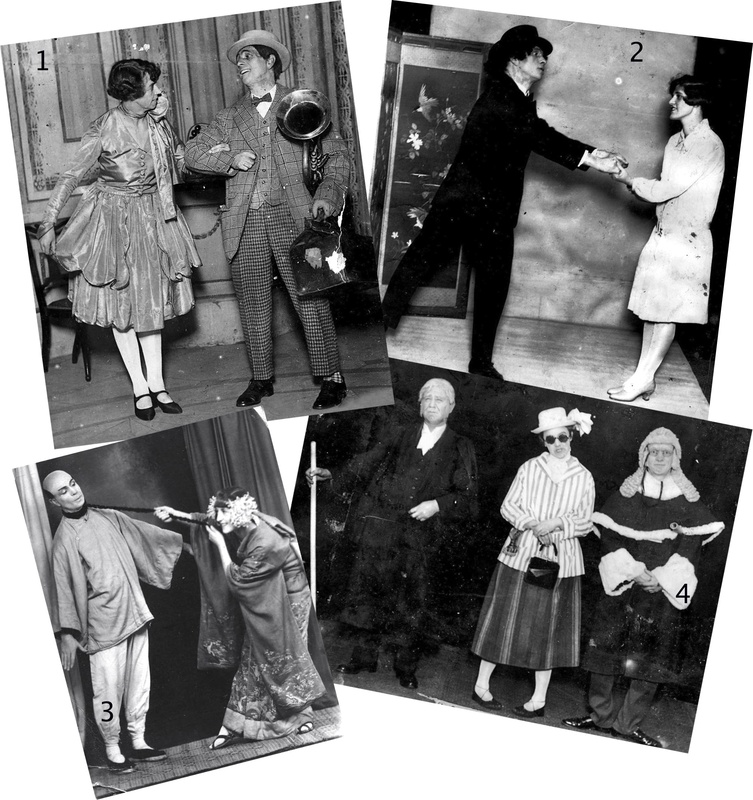 The close competition doesn’t seem to have caused problems between the two families as Frederick became friendly with and eventually married the Adam’s daughter, Mary Jane. Frederick himself was a trained baker but decided to go into business as a carter. 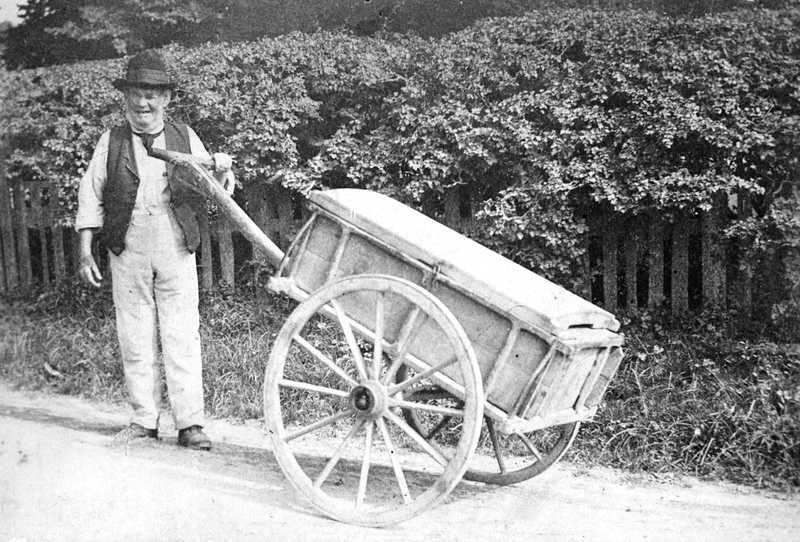 His carts can be seen in a number of old photos and postcards of Shoreham – rugged two-wheeled carts that he used to collect flints, gravel and sand from the beach as they had been for centuries before by builders and road makers. His horses were stabled in the High Street and were often used to launch the town’s lifeboat from the beach. The business prospered and part of the reason for this may have been his willingness to diversify. 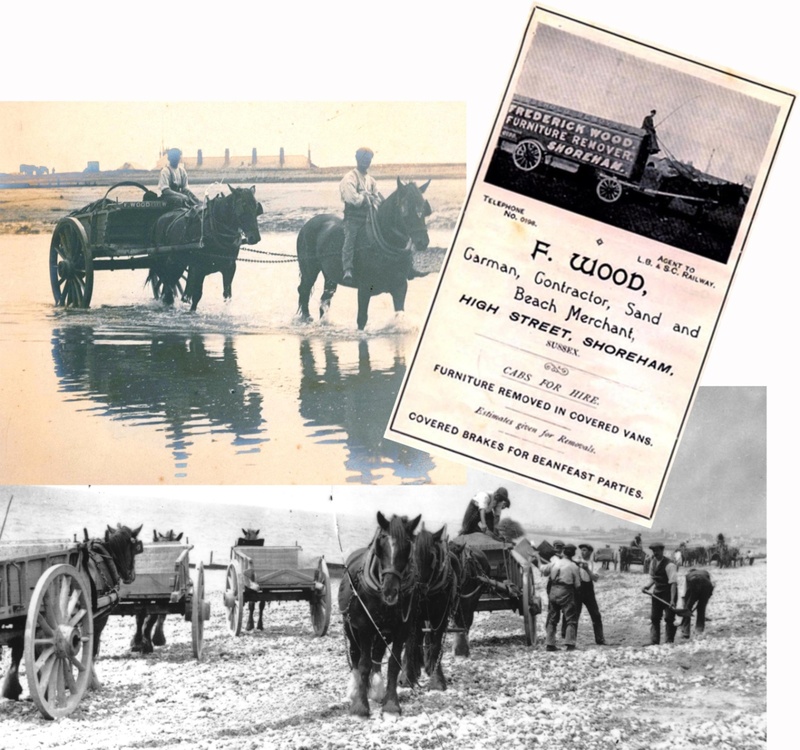 He purchased enormous ‘vans’ or box-like carts to provide a removal service, hired out his cabs and was eventually appointed the Shoreham agent for the London Brighton & South Coast Railway. Top left – Wood’s carts crossing the river with the coastguard cottages on the beach in the distance Below – Carts removing washed flints from the beach. Overlay – An advertisement for Frederick’s business reputedly showing him perched on the front of one of his removal vans – the reference to ‘bean feast’ parties seems amusing now but tended then to be a term for picnics rather than over indulgence! Frederick kept his carts and cabs in rented fields and land in and behind the town but worked from his house in the High Street. In those days there were still a number of private residences in the town’s main street and his was one of them called ‘Riverside’ at no 72, nestled as it was between a general stores at 74 (part of the old 17th century building on the corner of West Street) and the ‘Don Smoking Lounge’ and the ‘Brighton Equitable Co-operative Society’ at numbers 70 and 68 respectively. Frederick Wood died in 1929 at the age of 87. Top right – Frederick Wood’s parent’s shop (far right) in the High Street opposite the Town Hall (during the great snowstorm of 1881) Below – Frederick at the gate of ‘Riverside’ Top left – The front garden wall and ivy-covered house can just be made out right of centre with the West Street junction beyond it. Born at Shoreham in 1871 the son of a master mariner, Oswald married Maude Louisa Siffleet in 1894. 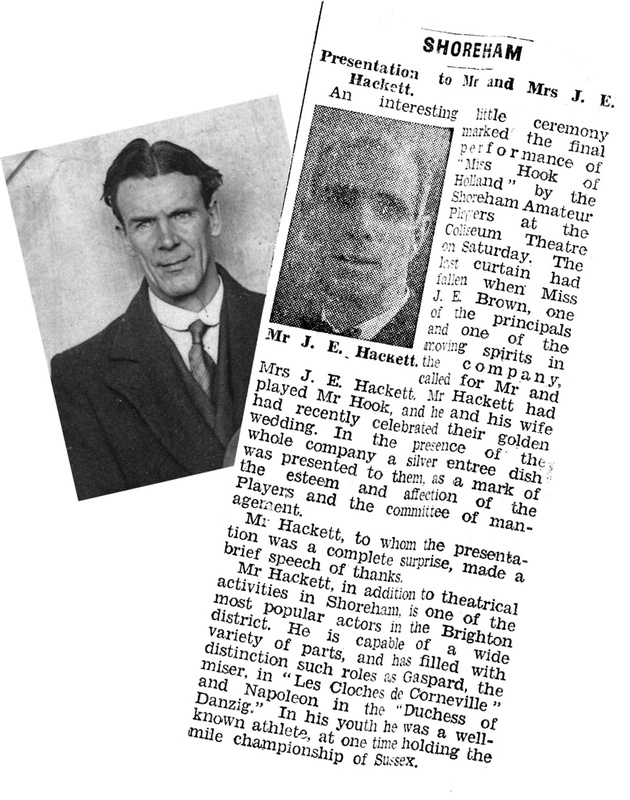 He was headmaster of Ham Road School 1910 – 1915, later Victoria Road School 1915 – 1935 and passionately interested in football becoming secretary then manager of Shoreham F.C. 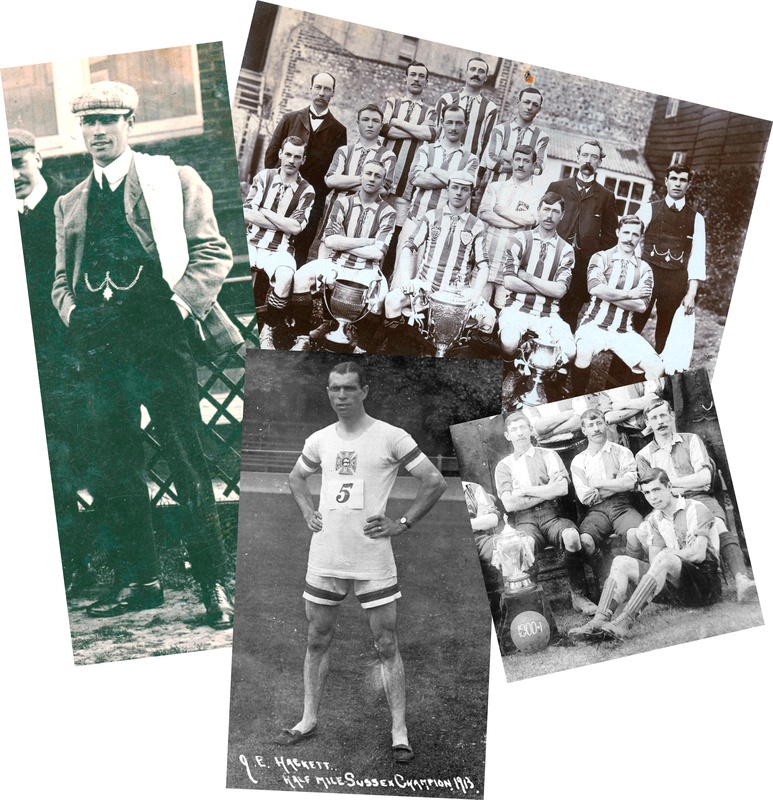 (he features in most of the team photos of the time) during their most successful years (1900-1910) as the foremost amateur team in Sussex. Oswald grew up with the Winton family and played a big part as the official Secretary helping with the organisation of the Winton Regattas and Carnivals during the 1920’s. 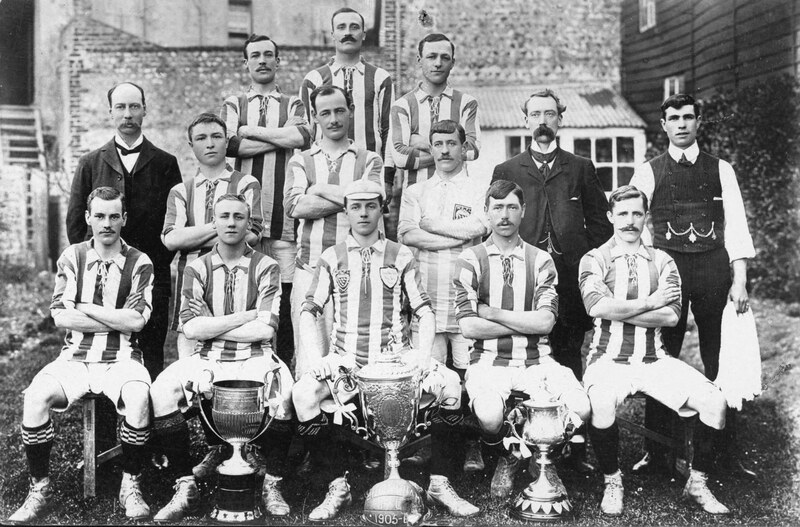 Oswald Ball (second row, second from right) manager of the 1905/6 Shoreham F.C. team that won the Sussex R.U.R. Challenge Cup, The West Sussex League Cup and the Sussex Senior Cup. After Ham Road School Oswald was appointed in 1915 as the first headmaster of Victoria Road School and continued there until his retirement in the mid 1930’s. Tragically one of his sons was killed whilst flying with the Royal Flying Corps during WW1 (2nd Lieut. Oswald Frederick Gravette Ball, 13 Artillery Observation Squadron, Royal Flying Corps flying R.E.8 aircraft, buried Aubigny Communal Cemetery F.1174) but his eldest daughter Leah later followed him to become headmistress at Ham Road then Victoria Road. 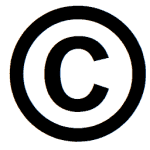 Oswald also served on the Council for a while in the 1930’s. In his later years Oswald lived at 14 Ravens Road and eventually died there at the grand age of 90 in 1954. By virtue of his work in our schools, for football in the town and on the council he contributed much to Shoreham and Shoreham folk. His trademark period moustache tends to give him a comical appearance but he was a much loved and respected character by all that knew him. Arthur Eade was born in 1846 at Thorpe Bay in Essex and arrived in Shoreham during the 1860’s. In 1864 he married Mary Payne Ratcliffe, born 1835 from the long-standing seafaring family of Shoreham. They opened their first grocery store at 6/8 High Street near the junction with East Street and lived there above the shop. 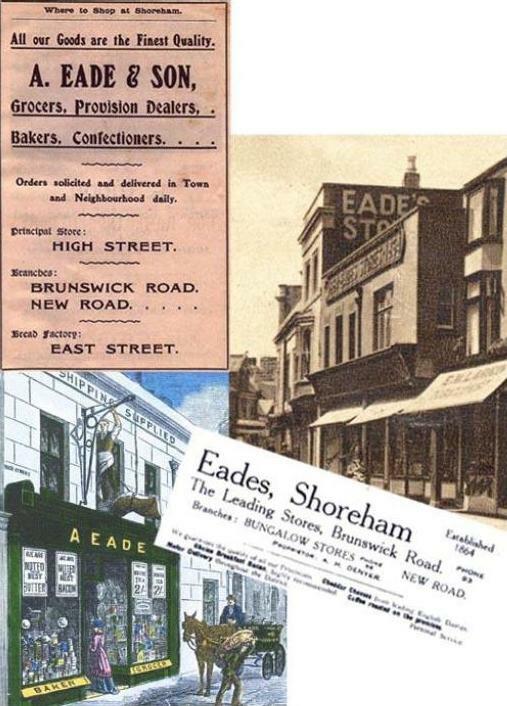 Four further premises ultimately resulted bearing the family business name of A. Eade and Son at 33 Brunswick Road, 73 New Road, 16 Ferry Road and a bakery at 8 East Street. The couple had two daughters, Annie in 1873 and Alberta in 1875 but it was their older brother Arthur Frederick William Eade (b. 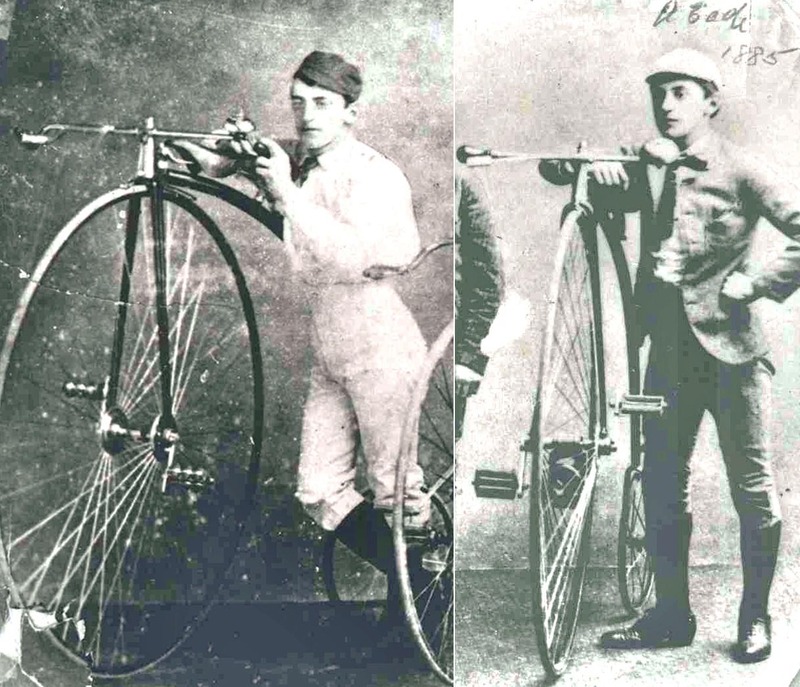 1867) who in his earlier years made more of a mark on the town as one of the founder members of the tongue in cheek Shoreham Bachelors Society (1) and as an enthusiastic cyclist who won the 1886 race from Shoreham to Bramber and back on his penny-farthing bicycle. Throughout the first half of the 20th century Arthur F.W. is shown as a commercial traveller and was almost certainly work he carried out on behalf of the family business. The Eades had a close affinity with the family of Henry Cheal, the Shoreham historian. 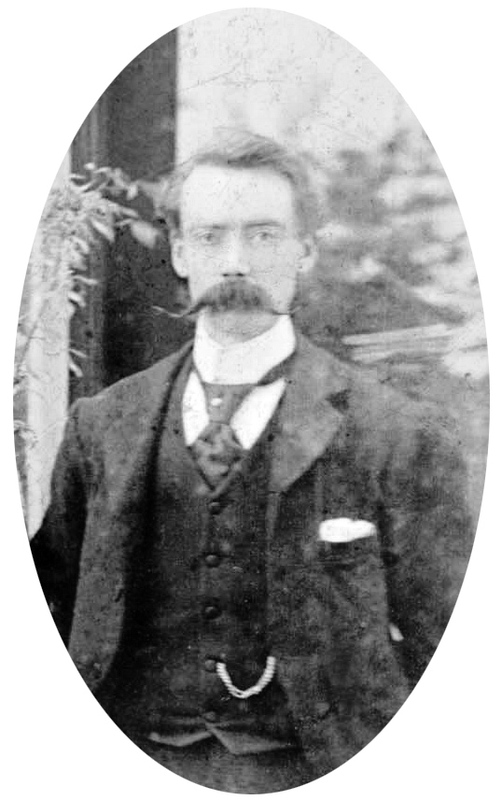 Walter Joseph Eade, son of Arthur Eade senior’s brother married Susannah Cheal, Henry’s sister. Arthur F.W. Eade married Anne Cheal another sister of Henry in 1894 and had a daughter Christine b.1896 but Anne died in 1900 at the tragically young age of 28. 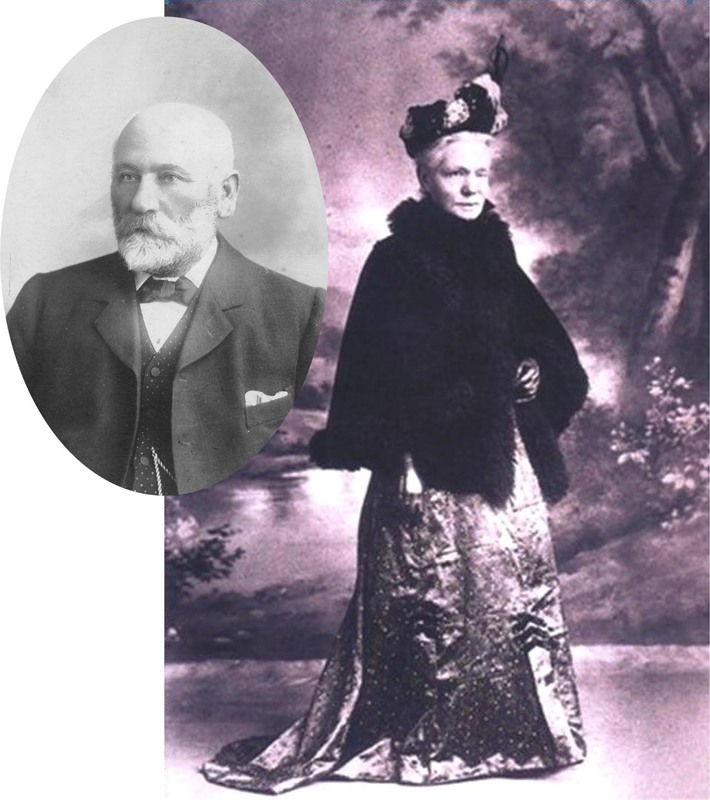 Arthur married for the second time to Grace Rebecca Cheal his deceased wife’s sister about 1903 – she was 13 years younger than him. 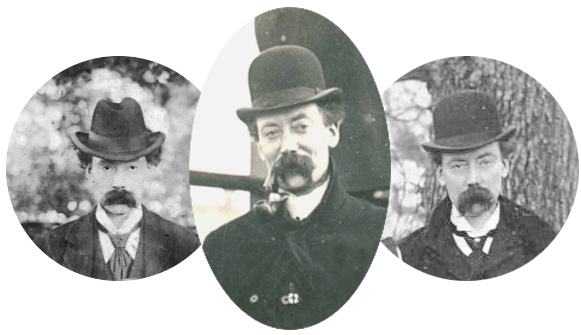 Arthur assisted his brother in law by carrying out photographic work in the production of the book ‘The Ships and Mariners of Shoreham’ and also provided other help, perhaps financially, with the next publication ‘The Story of Shoreham’ a contribution acknowledged by Henry in both his books. 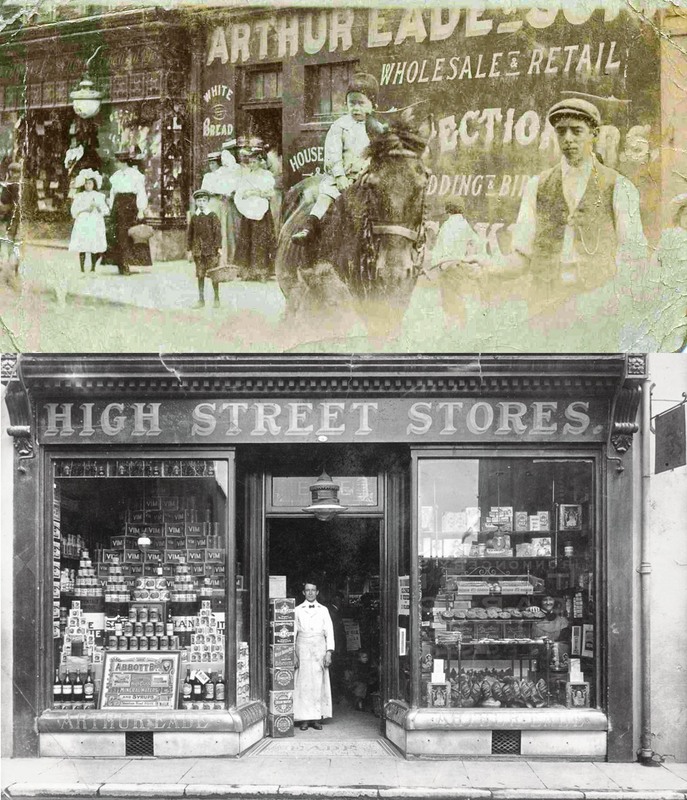 Top: The East Street bakery Below: The store at 6/8 High Street. 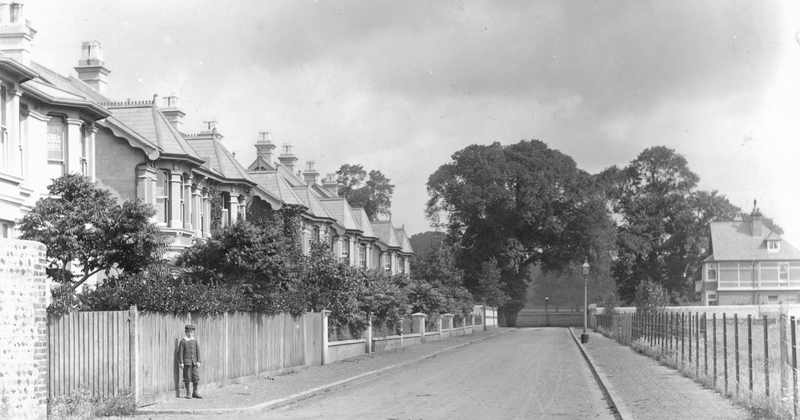 In his early adult years Arthur junior lived above the shop premises in New Road then during the early 1900’s he moved with his family into the grand ‘York Lodge’ house in Southdown Road and it is there that two surviving photos were taken showing the Eade and Hedgecock families. It may be that this was a gathering arranged by the Eades to commemorate the Shoreham cyclists of the 1880’s. Taken about 1903 the first photo shows front row, seated from the left (their ages at the time added):- Arthur Eade (senior) 57; Christine Eade his granddaughter 7; Annie Eade daughter 30; Mary Eade wife 68; Alberta Eade daughter 28; Caroline Hedgecock 37 and her daughter Lilian 2. Back row from the left:- George Hedgecock 38; Arthur F.W. Eade 36. The remainder have not been identified but could possibly be G. Farley or Fred Read who used to race with George Hedgecock and Arthur F.W. Eade in the 1880’s; Florence Harker (reputedly Shoreham’s first woman cyclist); unknown girl, then Albert Ernest Patching 27, who subsequently ran the Shoreham Athletic and Cycling Club. George Hedgecock’s wife Caroline, nee Stillaway, was well known to the Eade family having boarded with them during her time at their shop as an assistant before she courted and married George. George himself was also known to the Eades as his shoe shop was next door to their bakery in East Street and in his younger years was also a keen cyclist and friend of the son Arthur. The second Eade photo is believed to have been taken in 1912 and shows – front left to right:- Lilian Hedgecock 10; Tim Hedgecock 6; unknown; Reg Hedgecock 2. Seated left to right:- The first four have not been positively identified but may well be Fred Miles 34, an Argus newspaper reporter who accompanied George Hedgecock on a marathon motorcycle ride from Shoreham to Edinburgh and back (2); Harriett Eade 69 and husband Walter N. Eade 69 brother of Arthur; possibly Mary Eade 77 (and if so she is looking ill and aged, almost shockingly so, in the nine years since – she died in 1914 aged 80); Arthur Eade 67; George Hedgecock 46. In the back row are from the left:- Annie and Alberta Eade 39 & 37 respectively; perhaps Albert Patching 34; unknown, unknown; A.F.W. Eade 43; Christina Eade 16; unknown; unknown; Caroline Hedgecock 45. The seating/standing arrangement for the photo adds weight to the view that this gathering was to celebrate the motorcycle marathon to Edinburgh and back that George Hedgecock and Fred Miles had completed in August of 1912 ). 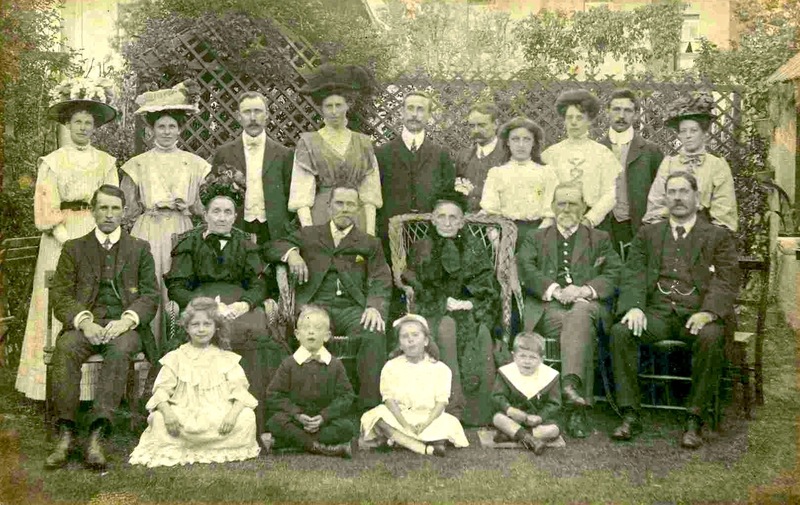 The unknown individuals in the back row appear to be mostly family and probably include Walter Eade junior and his wife Susannah as well as Arthur Eade junior’s wife Grace. 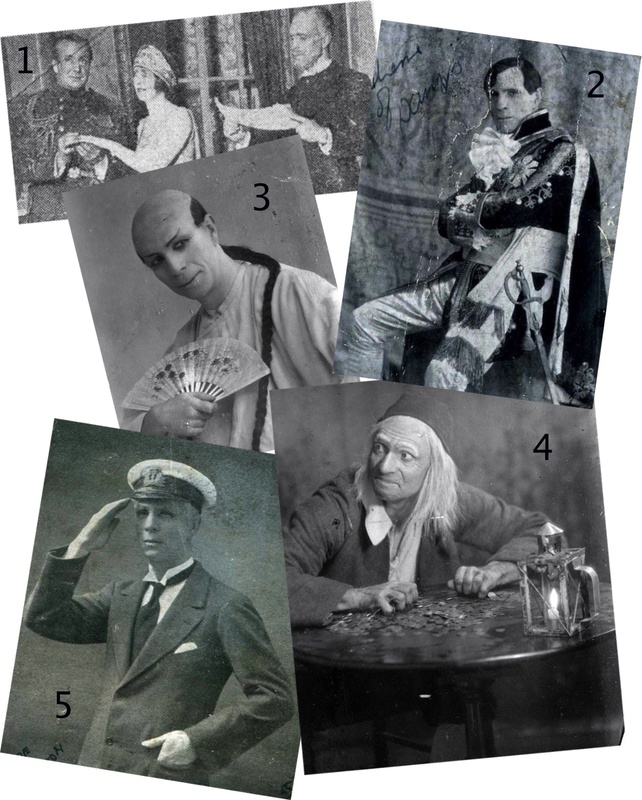 The four senior Eade family members are taking ‘centre stage’ and George Hedgecock is given an important seat alongside Arthur Eade senior but Arthur Eade junior is relegated to the back row. Nevertheless, this fits in nicely with the marathon concept that Fred Miles, even as a non-family member, is given the other seat of honour on the opposite, matching side to George Hedgecock. Arthur senior and Mary remained living at the High Street premises where the former died in 1921. His son later moved from York Lodge to Goldstone Crescent in Hove during his later years and died there in 1953 aged 86. 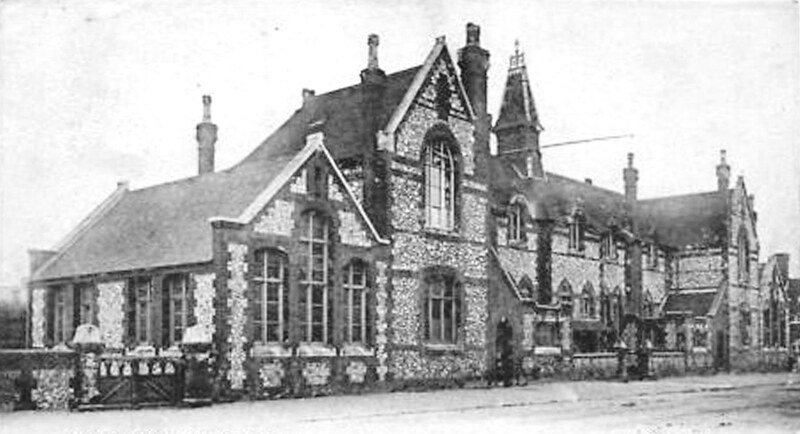 (1) see ‘The Rise and Fall of Bachelors Hall’ at Shoreham and Worthing libraries, West Sussex Archives and the Shorehambysea.com website history portal. (2) see ‘The 1912 Shoreham/Edinburgh Motorcycle Marathon’ and the Hedgecock Photograph Collection on the Shorehambysea.com website. 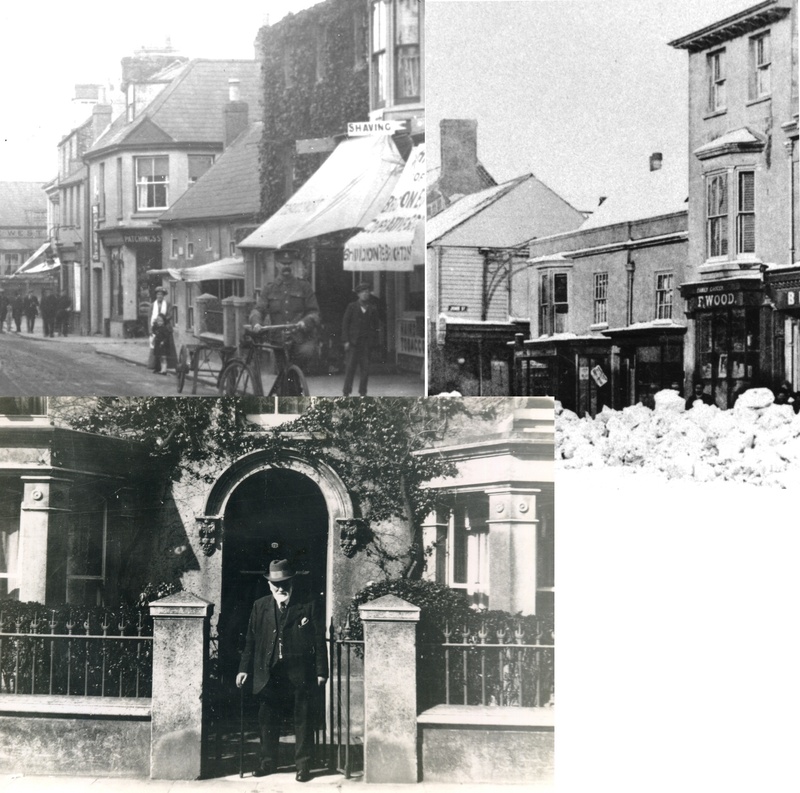 Frank Rowe ran the newsagent’s/stationer’s shops in the High Street and Brunswick Road, photographed Shoreham scenes and events then sold them as postcards. 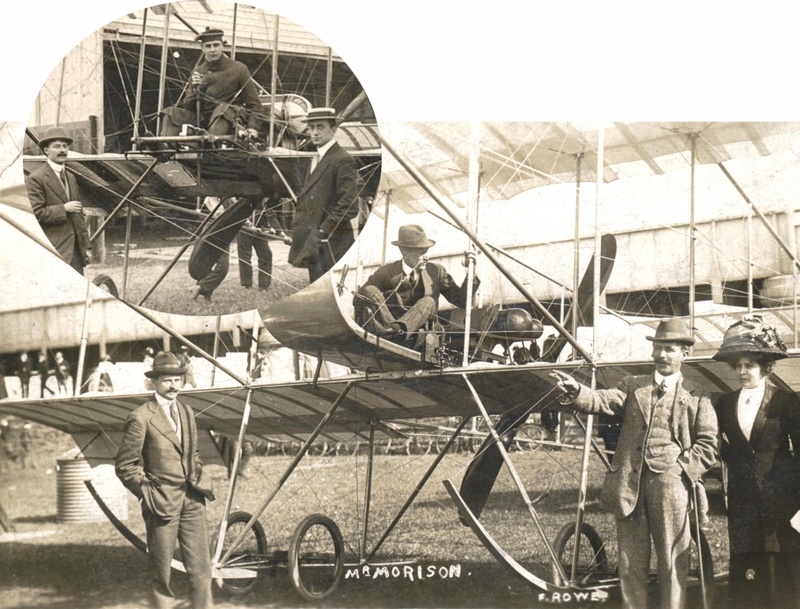 He was particularly interested in the early flying at the airport taking many photos of the aircraft and pilots there. During the early years of the 20th century he was a well-known figure often seen in Shoreham and Bungalow Town delivering the morning papers. 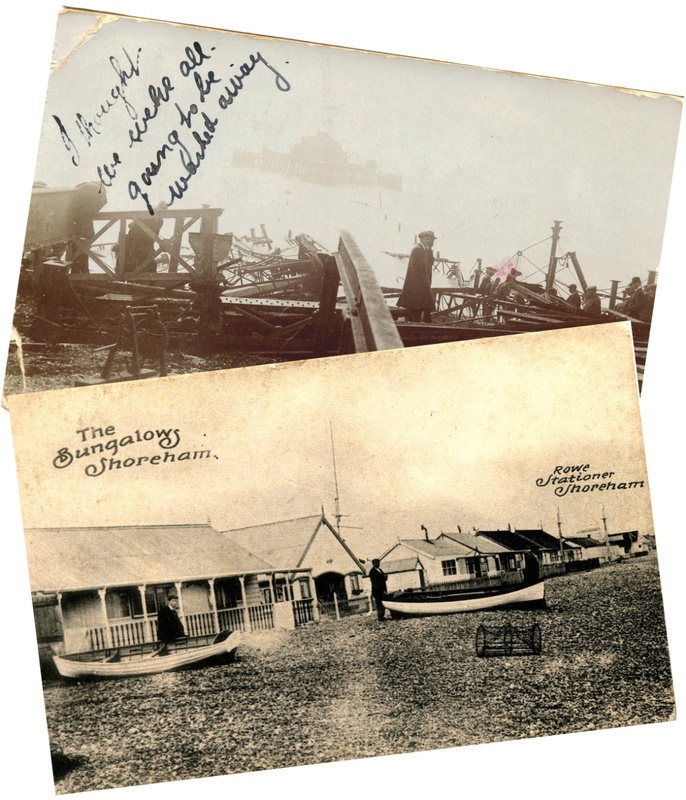 whose collection of postcards is shown on the shorehambysea.com historic photo galleries) in Shoreham. The reception was at Frank’s house at 27 Queen’s Place – the photo shows him sitting with his bride outside number 27. Peculiarly, in the background there is one of the group who presents an exact profile view of himself – something that sometimes happened in group photos of this era and perhaps it was purposely arranged by the photographer as a contrast. 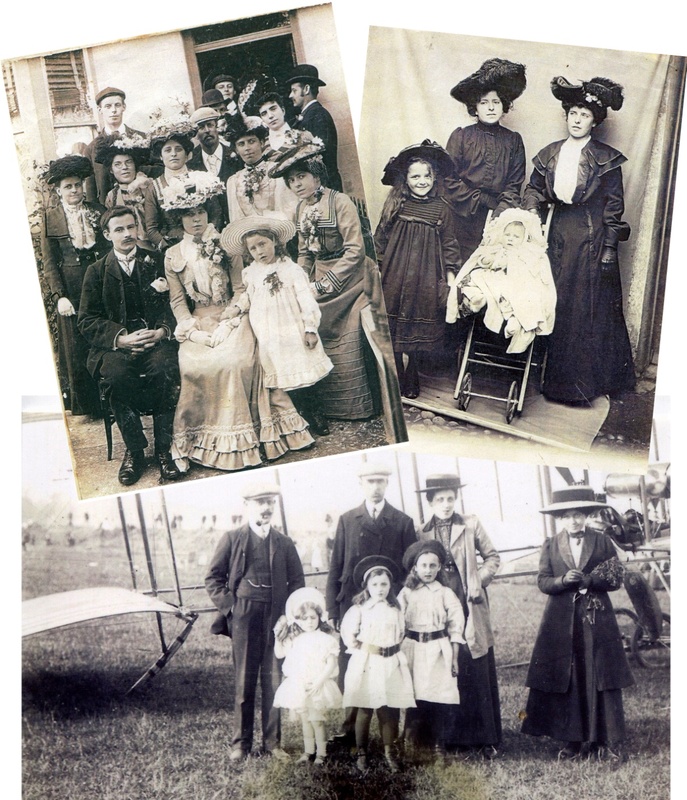 The couple went on to have three children Frank Thomas 1904 Alice Mary 1906 and Ethel Bessie in 1907. He moved to premises in the High Street on the west corner of Church Street then another in Brunswick Road. Despite strong competition from other Shoreham postcard manufacturers such as Winton and Page, Frank produced many real photograph cards by capturing events as, or soon after, they happened. The men and aircraft as they visited the airfield, the collapse of the Southwick lock, the storm damage at Worthing pier, wooden bungalows on the beach destroyed by fire etc., as well as individual buildings in Bungalow Town and Shoreham itself. The popular card of the railway carriage being towed across the river by horses prior to its use as part of a new beach bungalow was also one of Rowe’s. At the outbreak of WW1 Frank joined the Royal Flying Corps using his photographic knowledge and interest in aircraft as a cameraman in reconnaissance aircraft. Unfortunately for him during one flight his aircraft flew through a cloud of mustard gas and although Frank survived the experience and the war he died soon after from the damage this did to his lungs. ….. and finally we don’t know an awful lot about this last character and only have two photos of him. Nevertheless, we still thought it worthwhile to include someone to represent the thousands of anonymous residents of the time who lived, worked and died in the town – they were themselves Shoreham. 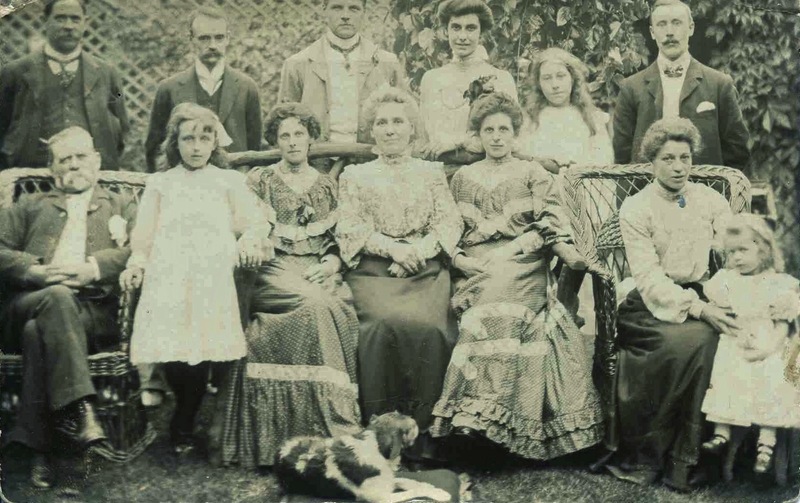 Born in 1835 the son of William Lindup, Reuben is of particular interest as he is one of the few poorer working class Shoreham people during the early 1900’s that can be individually identified from more than one photo. The Lindup name (variously spelt ‘Lindupp’) first appears with two families in New Shoreham in 1791. Most of the men in these families were recorded as ‘common labourers’ although there was a William Lindup who was master of the seven-crew fishing vessel “Three Sisters of Shoreham” in 1871. As a child, Reuben’s parents were living in Ship Street and he moved to the east side of West Street after he married where he raised his own family and remained for the rest of his life. Like his father, Reuben probably worked on all kinds of unskilled jobs turning his hand to whatever employment was available. Even at the age of 65 he was still picking up work but by then had secured more regular employment as a ‘turncock’ with the waterworks company. This entailed pushing a handcart around town being ‘on call’ visiting houses and turn off water at the mains to enable the householder to have plumbing or repair work carried out. He would have been known to many and was probably heard before he was seen as his cart clattered down Shoreham’s streets particularly in Church Street where the water company had their store at number 14. Here there was once a wide passageway through the house big enough to take a cart that in later years was used as an access for cars when it became a garage complete with a petrol pump outside. It was in Church Street that he became known to William Winton who lived at number 9. The local photographer, probably William Winton himself, obviously saw him as a local character and took the first of the photos we have of him. 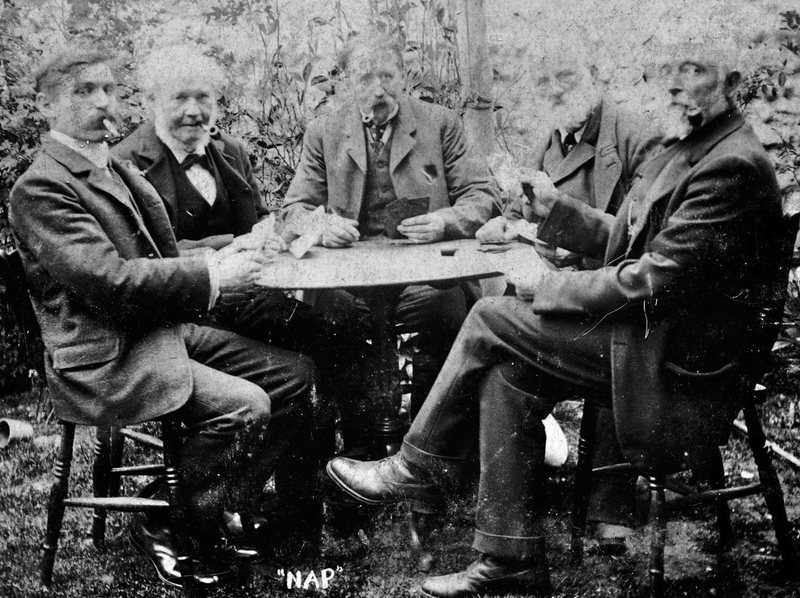 Reuben may already have been one of Winton’s friends in any case as we next see him in a shot of a card playing group in the Winton family garden at 9 Church Street. Reuben married a girl (Harriett) from Henfield and had a daughter Emma but she married and moved away from Shoreham. Reuben died at Shoreham in 1912 aged 77 and subsequently the name of Lindup disappears from the town altogether. I am undertaking family history and am interested in a ship which sank on the way to Chile. The Barque was registered in Shoreham in 1853 and was named The “William Marsland” . She was sunk in a collision in January 1860. I would be grateful for any information you have.